Is cutting Saturday mail self-defeating? U.S. 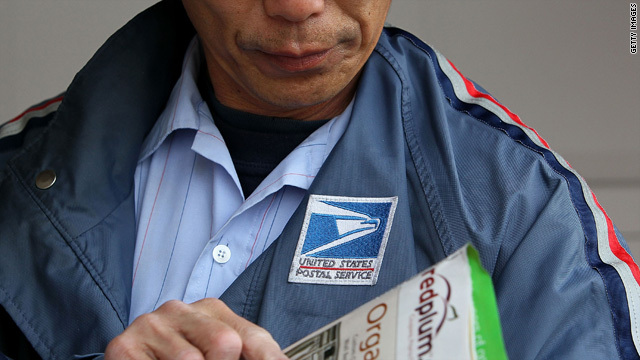 Postal Service letter carrier Raymond Hou sorts through mail along his route March 2 in San Francisco, California. Editor's note: CNN Contributor Bob Greene is a bestselling author whose new book is "Late Edition: A Love Story"
(CNN) -- Not to put a damper on your weekend, but could this be the beginning of the end? The beginning of the end of daily, reliable, relatively inexpensive mail service? As you undoubtedly have heard, the U.S. Postal Service wants to do away with Saturday delivery. Regulators are being asked to approve the request. The Postal Service is bleeding -- all right, hemorrhaging -- money. It reported a loss of $3.8 billion last year. Its leaders are saying that unless something dramatic is done, it will face deficits of $238 billion over the next 10 years. Last summer, when I wrote a column here about the theoretical elimination of Saturday mail, there was an opportunity in conjunction with the story to register a quick vote on the issue. More than 397,000 people voted, and the overwhelming majority said they didn't care whether they got Saturday mail. Sixty-eight percent said they wouldn't miss it. Only 32 percent said they would. If mail delivery goes from six days to five, more and more Americans may decide they just don't need it. People have available to them, as none of us needs to be reminded, computers with e-mail capability. You can correspond with friends and family and business associates; you can pay bills; you can send greetings. Using the U.S. mail already means accepting that letters will be held up for a day between Fridays and Mondays. Elimination of Saturday mail would extend the bottleneck. And this is a country that increasingly demands speed; you'd think that someone, if only in an effort not to fall further behind, would be suggesting a seventh day of delivery be added. Last year, the volume of U.S. mail fell by 26 billion pieces -- from 203 billion to 177 billion. The Postal Service, in gambling that doing away with a day of delivery will help heal its financial wounds, may be risking a lot. There's not much of a track record in American business for cutting back on services and then seeing the long-term bottom line grow. Companies that boldly announce they are going to cut their way to prosperity often cut their way to death. If delivery is reduced to five days, and the number of letters mailed each year plunges further, the Postal Service could find itself in the position of having to eliminate even more services. Five days could conceivably go to four, or three; and if that didn't stop the plummet in available funds, what would be the next step? Fredric V. Rolando, president of the National Association of Letter Carriers, recently wrote a letter to The New York Times (I'm hoping it was a traditional letter, and not an e-mail; if he isn't using the U.S. mail, we're really in trouble). He's hardly a disinterested party; he wants his members to keep their jobs. "No business ever bounced back to health by rushing to offer slower service and turning customers away. ... Eliminating Saturday delivery would send the wrong message to both citizens and businesses, that this public service is about to get a lot worse. ... The worst thing Congress could do is allow it to drop Saturday delivery." Once you try to convince people that they can live without you a little bit, they begin to realize that perhaps they can live without you a lot. The great American passenger railroads, in the face of jet air travel and dwindling revenues, started to provide less frequent service to fewer places. They blamed it on cost factors. They hoped they could slash their way back to success. But as you may have noticed, the 20th Century Limited doesn't come around here anymore. Why does this matter? Earlier in today's column, I referred to "relatively inexpensive mail service." You may have smiled at that; the price of stamps keeps going up and up. There's a service available to you. A federally designated courier will come to your home every day but Sunday, and pick up whatever you would like to have hand-delivered to someone else in the country, no matter how far away. The courier and his colleagues will then take your envelope to that person in a matter of days. You don't need to leave your house for this service, and neither does the person on the other end. You might ask: How much does this service cost? If you were told that the answer is 44 cents, you might think you were getting a pretty good deal. But if fewer and fewer people use the U.S. mail, and thus provide fewer and fewer dollars to the U.S. Postal Service, that 44-cent price tag is going to climb like never before. Well, maybe somewhere there's an example of how giving customers less makes them more loyal and appreciative. Makes a business thrive.